Now, they’re vulnerable because 8 percent of multiemployer pensions are collapsing. This is not the workers’ fault. Often, it’s not even the employers’ fault. It’s because of economic forces that couldn’t be predicted and Congressional decisions to deregulate Wall Street and ignore trade violations. Congress could help. It moved in that direction by establishing the Joint Select Committee on Multiemployer Pensions. The committee set a deadline of Nov. 30 to recommend a solution. But after researching for a year and conducting five hearings, the committee appears paralyzed. That’s no help to Daryl and 1.2 million other working and retired people facing financial crisis. “Please adopt legislation that would protect our benefits,” Daryl implored. Legislation was introduced last year that would protect the pensions. It’s called the Butch Lewis Act. It would enable the Treasury Department to sell bonds to finance long-term low-interest loans to the troubled pension plans. That’s what Daryl and the 300 other USW members who wrote the Joint Select Committee this year want. Or something similar. They won’t nitpick. They’re scared. This is déjà vu all over again for the USW. The union, the largest in manufacturing in North America, representing workers who make steel, aluminum, tires, paper, glass, boxes, chemicals, gasoline and myriad other products including coffins, worked hard in the 1970s to ensure that pensions did not end up six feet under. The USW pushed Congress to pass the Employee Retirement Income Security Act of 1974 under which the Pension Benefit Guaranty Corporation (PBGC) was established. The PBGC works like insurance. Pensions pay into it, and if one fails, the PBGC provides benefits to the plan’s intended recipients, often in amounts lower than those beneficiaries would otherwise have received. Still, something is better than bankruptcy. The PBGC fund for multiemployer pension plans is not, however, exactly flush with cash. Without some action, the PBG projects the fund will run out of money by the end of 2025. It could implode sooner if many of the 115 multiemployer pension plans described as “critical and declining” fail sooner than expected. As it is, actuaries project that 107 of the plans will go bust within 20 years. Brenda has it right. Many of these multiemployer pension plans were struck down by events beyond their control, events they could not have anticipated. It’s not that there’s something intrinsically bad about multiemployer plans. More than 1,400 of them are just fine. The ailing plans, however, confronted multiple crises. The PACE Industry Union-Management Pension Fund is one of them. Jim Allen, a retired USW member from West Carrolton, Ohio, who worked for a paper-making company now called Appvion Inc., submitted testimony to the Joint Select Committee about that fund’s problems. The U.S. paper industry has been whipsawed over the past quarter century by unfairly traded imports and the rise of electronic communications. Email, for example, reduced the need for paper. And too much of the paper that was sold came from China, where the government subsidizes the industry in ways that violate international trade laws. As a result, paper mills across the country closed and consolidated. Over the past decade, 63,000 production and nonsupervisory paper workers lost their jobs, factoring into the 5 million U.S. manufacturing jobs that disappeared since 2000. Now, Jim told the committee, fewer than 10,000 workers are actively paying into the pension plan, but it is responsible for payments to 25,000 retirees. And another 30,000 will be entitled to benefits, though they no longer work for one of the plan’s employers. Like nearly all pension plans, it lost value during the Great Recession, a catastrophe caused by Congress deregulating banks. Loss of a pension strikes fear in the hearts of workers who shaped their lives around the covenant between them and their employer that they would receive in retirement compensation they deferred while working for decades. In fact, the workers like Cindy covered by these pension plans worked hard and played by the rules. Similarly, their employers put up a good fight to survive, merging, cutting costs and straining to preserve pensions and jobs. 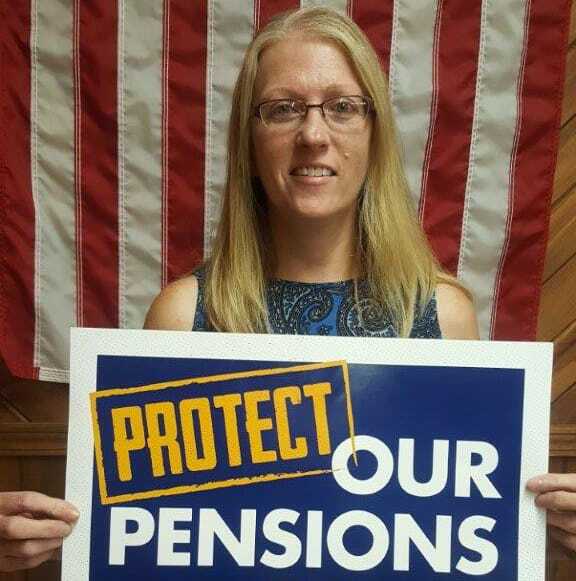 Laura Hanan, the wife of a USW member from Sussex, Wis., also wrote the Joint Select Committee about her anxiety: “I literally did not sleep last night worrying about all of the people who will not get their pensions when they retire. It does not seem fair. They receive betrayal – unless Congress acts.